Powers/Abilities: When not transformed by his former curse, Raymond Coker possesses the normal human strength of a man of his age, height and build who engages in minimal regular exercise. Raymond Coker has extensively studied some aspects of the supernatural in his search for a cure for his lycanthropy. At one point he discovered a spell (or ritual) which enabled him to prevent his body from transforming into its werewolf form during the full moon. This spell required certain specific herbs which were hard to obtain and/or had to undergo a time-consuming process in order to be effective. When his spell was disrupted, Coker claimed that it had been destroyed and could never be restored when in fact it could be prepared again but it would take months for him to do so. Aside from being able to cast this one spell, Coker has not demonstrated any other magical abilities (except, of course, for his lycanthropy). In his transformed state, Coker possessed the conventional abilities common to most werewolves: enhanced human strength, speed, agility, reflexes, stamina, resistance to injury (except if caused by silver or wolfsbane) and enhanced senses of hearing, smell, taste, and sight (including night vision). His werewolf form also possessed razor sharp claws and teeth. However, as a werewolf, Coker was somewhat weaker than Jack Russell's werewolf form. Coker's transformation into a werewolf only occurred when it was night and the full moon was above the local horizon (except for once when Doctor Glitternight forced the change). Since he always rejected and repressed his werewolf side, Coker never gained the ability to change between his human and werewolf forms at will, something which werewolves who have accepted their dual natures can do. His rejection of his werewolfism also prevented his werewolf abilities from ever reaching their full potential (as Jack Russell's did when he finally accepted the "beast within himself"). While in his werewolf form, Coker usually retained his human intelligence and ability to speak. Since this is something which is normally only possible if the lycanthropes in question have accepted their dual/bestial natures, which Coker absolutely had NOT done, some other factor must have been responsible. 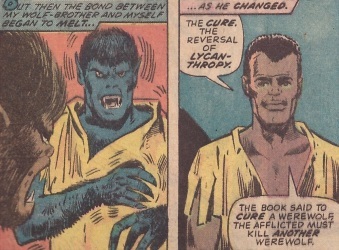 It's possible that the spell which Coker used to prevent himself from transforming may have continued to affect his werewolf form even after it was disrupted and no longer able to completely prevent him from changing. It should also be noted that when Coker tried to use the spell without all of the proper herbs, not only did the spell become ineffective after an hour but the werewolf form into which he then transformed was bestial and incapable of speech. This could mean that the after-effects of the spell had faded in the weeks since it had last been successfully cast. (Werewolf by Night I#19 (fb) - BTS) - Raymond Coker was born into humble beginnings in Jamaica. He struggled for years to better himself and finally prevailed. As an adult Coker moved to the United States where he then discovered that he bore the curse of lycanthropy. Since his condition would have destroyed all his life's work, Coker searched for and found a spell that controlled his curse. He began using the spell every time there was going to be a full moon. (Werewolf by Night I#19 (fb) - BTS) - At some point, presumably during his research into lycanthropy, Coker heard of the Libro del Malditos, a very rare book which dealt with supernatural subjects. Coker learned that there were only three copies (still?) in existence and that all three had been lost. (Monsters Unleashed#6/5 (fb) - BTS) - At some point, Coker (may have) enrolled at the University of California, Los Angeles (UCLA) as a student. (Werewolf by Night I#11 (fb) - BTS) - At some point, Coker began renting an apartment in the Colden House apartment complex in Los Angeles, California. (Werewolf by Night I#17 (fb) - BTS) - At Colden House, Coker was known for being reserved, in contrast to the "swinging singles" attitude of the other tenants. 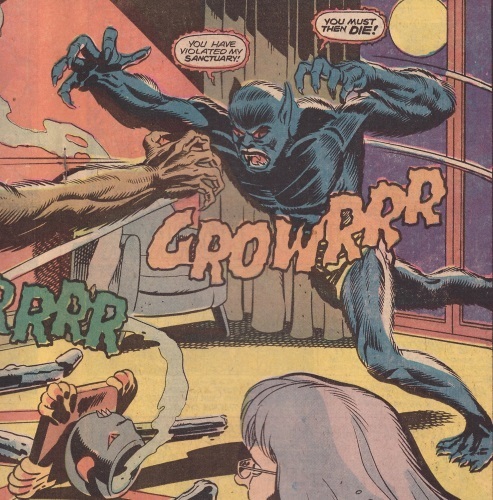 (Werewolf by Night I#11) - While in the hallway outside his apartment in Colden House, Raymond Coker collided with Tina Sands, the building manager, as she left the apartment of new resident Jack Russell. When Miss Sands offered to help pick up the books that he'd dropped when she bumped into him, Coker quickly and firmly told her to leave them alone because they were no concern of hers. Coker then picked up "Werewolf Blood" and "Supernatural - Volume IV" himself and bid Miss Sands good day. 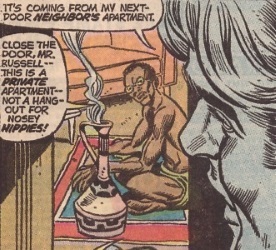 (Werewolf by Night I#12) - The next day, Coker burned some incense while sitting nearly naked on the floor of his apartment with the door partly open. When his new neighbor Jack Russell returned home, smelled the incense burning and looked inside, Coker told him to close the door because it was a private apartment, "not a hang-out for nosey hippies!" After exchanging a few more unpleasantries, Russell closed the door and left, dismissing Coker as a "paranoid nut." (Werewolf by Night I#13 (fb) - BTS) - Coker discovered that some of his books were missing and jumped to the (mistaken) conclusion that his new neighbor Jack Russell had taken them. (Werewolf by Night I#13 (fb)) - Coker barged into Russell's apartment while Jack was eating with his friends (Sam and Clary) and demanded the books that he believed Jack had taken from him. Russell denied having read or even looked at "those freaky magic books" and things almost got violent when Coker jabbed Russell in the chest with his finger. Coker then left but promised to return if his books weren't returned. (Monsters Unleashed#6/5) - Coker was carrying some books through the lobby of Colden House when Jack Russell stumbled into him, sending the books flying. Both men lost their tempers and began swinging at each other until Clary Winter came in and put herself in between them. The two men stopped fighting, but Coker accused Clary's "hippie friend" of having deliberately pushed him. Russell (although not actually guilty) apologized, picked up the fallen books (including "Origins of the Supernatural") and handed them to Coker, then offered to bury the hatchet. Coker rejected this peace offering, told Russell that he just wanted him to stay away, and left the lobby, leaving Russell to wonder what made Coker into the uptight person that he was. (Monsters Unleashed#6/5 (fb) - BTS) - That night, Coker was in his room when a violent motorcycle gang invaded Colden House around midnight and began breaking into the apartments and gathering the residents in the lobby. Clary, Sam and Sandy were among those taken captive but Coker was not. Sam believed that he might have put up a fight and been killed by the bikers. (Monsters Unleashed#6/5 - BTS) - Conjecture: Coker had been using his magic spell to prevent himself from transforming into his werewolf form. However, when the bikers invaded Colden House and began gathering its residents, Coker realized that his secret would be exposed if he stayed so he stopped his spell and allowed himself to transform, then exited the apartment complex without letting anyone see him. Once outside, the Coker werewolf spent the night running through the forest. In the morning, the Coker werewolf returned to his human form and started travelling back to Colden House. (Monsters Unleashed#7/5) <Saturday> - In the late afternoon, Coker approached Colden House but was ambushed by the bikers who gave him a solid thump when he loudly protested. The bikers then brought Coker into Colden House and left him in the lobby with their other hostages. When Sam saw his extremely disheveled appearance and asked what the bikers had done to him, Coker rejected her concern, stating that it was no business of hers and saying, "You're not my damned keeper, none of you are." Then, without another word, Coker moved to the far side of the lobby where he sat in a corner and ignored anyone who tried to talk to him. As evening approached, Coker stared out at the setting sun as if he was hypnotized by it. Ten minutes before moonrise, the biker leader (Kingston) and his chief thug (Boxer) decided that they should "take out" Russell and Coker first, before they "hit the others." Russell resisted and Coker almost smiled at him before Russell was knocked unconscious. Ten minutes later, Russell regained consciousnness on the beach with Kingston sitting on him. Boxer and Coker were nearby but out of sight behind a sand dune, and Boxer had begun to beat Coker to death. By then the full moon had risen and Russell began to transform into the Werewolf. Kingston was panicked by the change but he had a chain which he knew how to use effectively as a weapon. After one initial contact, Kingston kept his distance and used his chain to hurt the Werewolf who soon ran towards and up the nearest sand dune in hopes of finding a fairer battle ground. Kingston followed close behind and delivered a knockout blow just as they went over the dune. (Conjecture) - Meanwhile, behind the sand dune, Coker had been also transformed into his werewolf form but had then taken action more quickly than Russell by pouncing on Boxer and shredding his throat before he could scream out a warning. (Monsters Unleashed#7/5) - As the Werewolf and Kingston came over the dune they saw Boxer lying dead on the sand with his throat a "bloody mass" and his hands outstretched as though he'd been trying to push something or someone away from him. A "thing" that was *more animal than man" (Coker - but not recognizable as Coker) was looming over the body, hunched forward in a half-crouch. As the Werewolf fell unconscious, he heard Kingston shriek, a long, drawn-out death scream. (Conjecture) - The Coker werewolf killed Kingston and reduced his body to a bloody mess but didn't attack the unconscious Werewolf. Coker then either left the immediate area (to avoid the temptation of the people in Colden House?) or passed out himself. In the morning, Coker reverted to his human form again. (Monsters Unleashed#7/5 (fb) - BTS) <Sunday> - In the morning, Coker went to the nearest police station to alert them of the situation at Colden House. He claimed that he had been unconscious until dawn and had found the two bikers dead and Russell unconscious. When Coker and the police arrived at Colden House they found that the other bikers had run out without killing the other captives. (Monsters Unleashed#7/5) - Coker then led "an army of cops" (and Sandy, Clary and Sam, among others) onto the beach to where he'd told them Russell and the dead bikers were. He then suggested that it looked like "a wild animal" had gotten to them, and repeated his belief that "whatever" had attacked the bikers must also have attacked Russell and himself and that they were simply fortunate to have escaped with their lives. Coker then left the scene and headed back towards Colden House, leaving an annoyed police officer behind. (Werewolf by Night I#17) - On the morning before the first full moon of the month, Coker began his preparations for the casting of the spell that would keep him human that night. His chanting attracted the attention of Jack Russell who, desperate to find a cure, asked Coker about any experience he had had with werewolves. Panicked by the question, Coker reacted extremely negatively, asking what kind of vile thing Jack was insinuating and telling Jack to get out as he would have none of Jack's slander. After throwing a punch at Jack to get him to back away, Coker then slammed his door shut and leaned back against it. Briefly wondering if Russell could have guessed about him, Coker decided to ignore him and continue with his preparations. (Werewolf by Night I#17 - BTS) - That night, as Coker performed the spell which kept him human, he was (apparently) unaware of the violent activity that took place in the next door apartment between Russell (transformed into the Werewolf) and the android Behemoth which had attacked him. The Behemoth eventually retreated just before dawn. (Werewolf by Night I#17 - BTS) - The next evening, as Coker was performing his spell again, he was unaware that Lt. Hackett from the LAPD had come to Russell's apartment and announced that he had reason to believe a werewolf was there (in the building). (Werewolf by Night I#18) – Russell's conversation with Lt. Hackett was briefly delayed by the arrival of the new cleaning lady who, after turning on her vacuum cleaner, then attacked Hackett from behind with an axe. Jack yanked Hackett out of the way, knocking him out while doing so, and the cleaning lady revealed that she was really Ma Mayhem who had been sent by the Committee to bring the Werewolf to them. The rising of the full moon transformed Jack into the Werewolf, and he attacked Ma Mayhem but her silver weapons were very effective. Mayhem used her magical silver-coated whip to repeatedly slam the Werewolf against an interior wall until that wall gave way and the Werewolf was thrown into Coker's room, disrupting his magic pentagram. Coker cried out that the Werewolf had destroyed his spell and that it could never be restored and then fled the room but, once out of sight, he transformed into a black-furred werewolf and returned to his room to attack, crying out that the other werewolf had violated his sanctuary and "must then die!" As Ma Mayhem made herself scarce, the two werewolves began to savagely battle each other until they finally went through the glass door onto the balcony and over the edge, landing several stories below on a police squad car. Briefly dazed by the fall, the werewolves resumed their fight until a groggy Hackett fired at them from above. The Werewolf was frightened by the gunfire and fled but Coker pursued him until they reached the outskirts of Griffith Park where Hackett and the police caught up to them and prepared to open fire. A nearby crowd misunderstood the situation and prevented them from firing, giving the werewolves enough time to knock them all out and then flee deeper into the park where they resumed their battle. After fighting for hours, the stronger Werewolf was on the verge of killing Coker who realized that it was almost dawn and used his greater cunning to throw the Werewolf against a nearby boulder. As the Werewolf lay stunned, Coker fled to protect his identity, vowing that on the next night he would stalk and slay his foe. (Werewolf by Night I#19 (fb) - BTS) - Coker made his way home (or to somewhere) and acquired a change of clothes. (Werewolf by Night I#19 (fb)) - Back at Colden House, Coker approached Russell as he talked with the manager (Sandy), and Clary and pulled him into the nearby stairwell so they could talk in private. When Russell asked why he was so upset, Coker replied that "after last night" Russell knew why he was so angry. Coker then spoke of how he had struggled for years to better himself, how he had come to the United States and discovered the curse that he bore, and how he used a spell to control that curse. Coker then revealed that when Russell had come bursting through his wall the previous night he had destroyed that spell forever but in doing so he had revealed that he, just like Coker, was a WEREWOLF! Russell's attempt to keep Coker from being overheard (by covering his mouth) provoked Coker into punching him down the stairs. Russell then revealed that he hadn't even guessed that Coker was his werewolf rival until Coker had just told him and responded to the punch with a kick to Coker's jaw. Russell then tried to make peace and suggested that they could now work together but Coker refused, stating that he didn't need anyone's help. That afternoon, Coker began shadowing Russell. When Russell later left Colden House in a hurry, Coker, knowing that it would take him months to prepare his own spell again and hoping that Russell might have a solution, followed Russell in his car to Mallet Studios. To get inside, Coker then knocked out the guard at the gate. (Werewolf by Night I#19 (fb) - BTS) - Inside Mallet Studios, moonrise transformed both Russell and Coker into their werewolf forms. (Werewolf by Night I#19) - By the time Coker found the Werewolf he was on a lunar set being held by the vampires Lousis Belski and Liza Pyne who were about to drink his blood. Declaring that his mind still hated Russell but against demons such as the vampires his blood told him that they were brothers, Coker leapt at the trio, telling Russell to move aside so that Coker could kill them. Unfortunately, the Werewolf couldn't understand and so he didn't move, thereby blunting Coker's charge. While the Werewolf was dazed, the vampires both changed into talking bats whom Coker tried to attack but they eluded him and counter-attacked. As both vampires fastened themselves to his face, Coker began to scream in pain but then the Werewolf, remembering that "Black-fur" had called him "Brother" and saved him from the bats, came to Coker's aid and managed to pull both bats from his face. Once the vampires returned to their human forms, Coker attacked Belski but the vampire's superior strength easily knocked him back. With both werewolves on their kness, Coker recalled that wooden stakes could beat vampires and he grabbed two pieces of hard wood from the damaged set. Coker threw one towards the Werewolf but he thought that Coker had hurled the pointed stick at him and batted it away instead of catching it. As the vampires rushed them, Coker swiftly speared Pyne while the Werewolf knocked Belski unconscious and then threw him into the set's model of the Earth where he was impaled on one of the wooden pieces that made up its internal structure. With both of their foes defeated, the exhausted werewolves fell asleep. When the morning dawned, both werewolves reverted to their human forms and awoke. As they scattered the vampires' ashes, Russell explained how he had come to the studio to inspect Geraldo Kabel's trunk full of arcane artifacts. As they looked through the trunk, a less-hostile Coker mentioned that Russell had saved his life on this last night. The duo then found a book, the Libro del Malditos, which Coker revealed was very rare, with only three copies being known to exist, all of which had been lost until then. As they opened the book, Coker and Russell watched as the words on the page changed from Spanish to English, and together they read the following passage: "There is but one cure for the curse of the wolf: that the cursed one find another werewolf and kill him under the full moon." (Werewolf by Night I#20 (fb) - BTS) - During the next month, Coker tried to find more of the herbs that Russell had destroyed so that he would be ready to cast his spell to prevent himself from transforming by the time of the next full moon. (Werewolf by Night I#20) - One night during the first week after the last full moon, Coker was scrounging around in the dark looking for some replacement herbs when Russell came across him. Coker revealed what he was doing and the two of them discussed how they had recently found out that the only real cure for lycanthropy was for one werewolf to kill another one. Neither of them realized that their words had been overheard by a golden-furred werewolf (Lt. Hackett, transformed by a magic ring) who had been following Russell. (Werewolf by Night I#20 - BTS) - Later that night, Lt. Hackett visited Russell in his apartment and revealed that he had found out that the werewolf who had been sighted around Colden House was Raymond Coker. Hackett pressured Russell to help him stop Coker and Russell, to protect his secret, couldn't refuse. However, once he was alone, Russell complained aloud about how he couldn't help Hackett "scratch Coker." (Werewolf By Night I#21) - On the night of the next full moon, even though he hadn't had enough time to gather the proper herbs, Coker cast the spell that prevented him from changing. Despite this flaw, the spell managed to resist the change for almost an hour after moonrise but, even as Coker wondered how much longer it could last, the spell failed and Coker transformed into his werewolf self. Having transformed earlier, the Werewolf was waiting at the back door closest to Coker's apartment and when he heard Coker's growl he responded. The two werewolves, having fought together against the vampires, now considered themselves to be brothers of a sort and they left Colden House together, trying to reach the forest beyond Los Angeles where they could prowl free. However, they became lost in the city's maze of streets, giving Hackett enough time to catch up to them and use his car to trap them in a dead-end alley. Hackett then used his magic ring to transform into the golden-furred werewolf and climb to the roof of an adjoining building from which he leaped down and landed on the Russell werewolf. As Hackett continued to savagely slash Russell, Coker lunged forward to defend him but was stopped by a vicious kick to the head. Russell managed to free himself from the distracted Hackett who, realizing that his prey were too fast and nimble, retreated up the fire escape so that he could find some place where he would have more room to move and fight. Hackett then fled across the rooftops, pursued by Russell with Coker following behind. On the roof of a foundry, Hackett stopped and allowed Russell to tackle him, sending them both through a skylight into the building. Once inside, Hackett gained the upper hand and soon had Russell at his mercy, dangling from a catwalk above a vat of molten steel. As Hackett stomped on Russell's fingers, the Werewolf was close to losing his grip when Coker appeared above them and leaped down, striking Hackett at the base of his skull and sending him over the railing and into the flaming cauldron below. Hackett was vaporized in seconds. Once Hackett was dead, Coker changed back to his human form, now cured of his lycanthropy. Weeping, Coker then said, "The cure. The reversal of lycanthropy. The book said to cure a werewolf the afflicted one must kill another werewolf. And I've done that...I've killed another werewolf...whoever he was....and it's over...for me. With the bond between himself and his "wolf-brother" now gone, the Werewolf looked upon Coker as prey and almost attacked but instead he gently laid a hand on Coker's shoulder before turning away and leaving. As he watched the departing Werewolf, Coker said, "God help you, Russell. I know what your hell is like. I've been there...and now that I've returned, I almost wish I were still a werewolf - - so you could kill me." (Werewolf By Night I#33 (fb) - BTS) - Raymond Coker received word (from Maura?) that his aunt and uncle who lived in Haiti had died a month earlier at the same time, leaving his young cousin Banita an orphan. (Werewolf By Night I#29 (fb) - BTS) - In the morning, Coker left Colden House for Haiti. (Werewolf By Night I#29 - BTS) - That night, LAPD detective Lt. Northrup stopped by Colden House to visit Jack Russell but was told by Sandy that Russell had been evicted. When Northrup then asked if they could speak to Raymond Coker, Sandy revealed that Coker had just left that morning for Haiti and hadn't said when he would be back. (Werewolf By Night I#33 (fb)) - After arriving in Haiti, Raymond Coker went to the small village north of Mirebalais where his relatives had lived. Once there, he sought out Maura, a friend of his dead aunt and uncle who had been taking care of his cousin Banita since the deaths of her parents. When Raymond asked how his aunt and uncle had died, Maura could only repeat the story that Banita had told her before she stopped speaking completely. According to Banita, her family had been taking their evening meal when a man shattered their door, entered their home and murdered the two adults while Banita could do nothing but watch as her parents screamed for help which never came. Then, once they were dead, the man had dragged the bodies of her parents out into the night, leaving Banita behind, screaming. Maura revealed that Banita had lapsed into shock after telling her this story, and that the doctors in Port-au-Prince could do nothing except put her in a hospital. When Maura mentioned that there was no one to pay for the hospital, Raymond said he would see what he could do, then asked if Banita had seen the man who had killed her parents. Maura replied that she had but what she said could not be true because she said it was Jaranda. Upon hearing that name, Banita began speaking again, crying out that the man was coming to kill them. As Maura tried to calm her, Banita cried out, "It is him--it is Jaranda--!! Papa Jaranda!! Papa Jaranda!!" (Werewolf By Night I#29) - After cutting his way through sixteen miles of thick Haitian jungle, Raymond Coker arrived at his destination, a wretched-looking hut. Entering, he asked if he could come in and identified himself but the occupant cut him short, stating that she knew what his name was but cared nothing for the knowledge. She went on to say that she knew that he had come to speak to her about "restless death" because otherwise he, like all the others, would have no reason for braving the presence of "Jeesala of de Thousand Years." 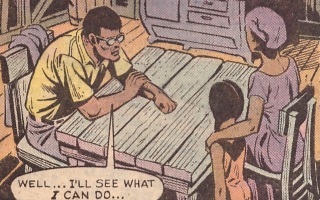 (Werewolf By Night I#31) - Jeesala stated that Coker had come to her because he had heard that she knew ALL of the dark secrets found in voodoo, and that he had come to her for help because his soul had been taken from him by the curse of the Beast-Man! (Werewolf By Night I#32) - Coker asked Jeesala how she knew about his curse and she replied that her powers of voodoo and the feelings of life from a mask on her wall told her that he was cursed by the mark of the man-beast. Coker revealed that he had been a werewolf but had been cured and that he had come to ask her help concerning "death which has killed." Jeesala replied that he was speaking of zuvembie, something which even she could not control, and that he had come to her for nothing. 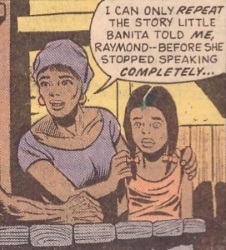 (Werewolf By Night I#33) - Coker then told Jeesala of something which had "happened two days ago" when he had come to Haiti to see his cousin Banita after learning that her parents had both died at the same time a month earlier. After recounting what Banita had said, Coker revealed that "Papa Jaranda" was his great-grandfather who had died 32 years ago. Jeesala said that this meant that the zuvembies had returned to Haiti, that it was a sad and very dangerous time and that the only one who might help him against them was named Jericho Drumm. (Werewolf By Night I#38) - Jeesala put Coker through a painful ritual which involved him levitating above the ground while having dreams which made him scream a lot. When it was over, Jeesala awakened him and revealed that she had lived his life. From what she learned about how he had been a beast-man before another beast-man had cured him, she told him that he "must go to..." At that moment, Coker experienced a vision sent by Burning Snake who revealed that Jeesala was going to correctly instruct him to seek the aid of Jericho Drumm but that once he had found Drumm he must lead him to Jack Russell. Burning Snake said, "He is the key, and you are his key. It will involve death, but it is an honor." As Coker asked who she was, Burning Snake replied, "We are the Three Who Are All" and then the vision ended. Coker fell to the ground as Jeesala, unaware of the vision, ended her instruction to "go to Jericho Drumm." Jeesala then told him to go NOW and to take Drumm to the beast-man who had cured him. Later that day, Coker arrived at the home of Jericho Drumm where the servant who opened the door confirmed that his name was Bambu, as Jeesala had told Coker. In turn, Bambu told "Raymond Coker" to come in because Brother Voodoo had been expecting him. (Werewolf By Night I#39 (fb) - BTS) - Coker and Brother Voodoo traveled from Haiti to Los Angeles aboard a plane chartered by Drumm and piloted by Bambu. Once there, Coker and Brother Voodoo went to Buck Cowan's Malibu beach house where they met Cowan, Topaz and Lissa Russell. At some point, Coker privately told Buck that he'd had a vision. (Werewolf By Night I#39) - Soon afterwards, Jack Russell arrived at Cowan's house and was surprised to find Coker and Brother Voodoo there. 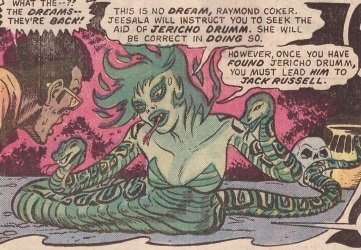 Coker explained to the confused Russell how the murders of his aunt and uncle by the long-dead Jaranda had led him to the witch-woman Jeesala of the Thousand Years who had directed him to Brother Voodo and about the vision he had had of a Burning Snake-Woman who identified herself as "The Three Who Are All" and who had revealed that Jack would soon become involved in that matter. At this point, Lissa revealed that she and Topaz had had a vision of a "thing" with a goat's head who had also called itself the Three Who Are All, and then Jack revealed that he too had had a similar vision. Brother Voodo soon revealed that he had also had a vision but of all three entities and that they had told him that their upcoming mission was crucial to the entire world. As the group prepared to leave for the plane that would take them to Haiti, a horde of fast-moving zuvembies broke in through the dors and windows and began attacking. Everyone fought back but Coker was soon knocked out and carried away by three zuvembies. In was only when the zuvembies had all been defeated (and their remains had exploded into smoke, thus proving that they were not true zuvembies) that Lissa noticed that Coker had been taken. Concerned that the death prophesied by the visions might be Coker's death, Brother Voodoo, Topaz and Jack (kept in human form by the spirit of BV's dead brother, Daniel) set off for Devil's Grotto in Haiti where the Three Who Are All had told Brother Voodoo that destiny would await him and Jack. (Werewolf By Night I#39 - BTS) - Meanwhile, Coker's zuvembie abductors had transported him (presumably by some mystical means) to Devil's Grotto where their creator, Doctor Glitternight, transformed him into his werewolf form and hung him on ropes of energy emanating from Glitternight's chest. (Werewolf By Night I#39) - After having made their way to Devil's Grotto, Brother Voodoo, Topaz and the Werewolf (now partially controlled by Jack's mind) heard sounds ("like the moaning of the tortured and the damned") coming from a tunnel entrance just under the rim of the grotto. Following the moaning led the trio to a chamber where they found Werewolf Coker suspended by energy-ropes and suffering agonizing pain. As they moved to help Coker, Brother Voodoo realized that he was being used as bait for a trap but it was too late. As they reached the center of the chamber, more fake zuvembies formed from the rock walls and surrounded them even as Doctor Glitternight revealed himself as the source of the light-ropes and confronted the Werewolf who had (seemingly) killed him in their previous encounter. (Werewolf By Night I#40) - As Doctor Glitternight confronted his enemies and boasted of how he would slay them and corrupt every soul on Earth until he had a legion of mindless followers of evil, Brother Voodoo sent Daniel's spirit to possess Glitternight, causing the light-chains holding Werewolf Coker to disappear, dropping him to the stone ground below where the impact rendered him unconscious. As Topaz protected him from attacks by Glitternight's light-zuvembies, Coker began to slowly revert to his human form but then the evil sorcerer regained control of himself and used the light from his chest to scoop up Topaz and the now-human Coker and carry them away with him as he escaped. (Werewolf By Night I#40 (fb) - BTS) - Doctor Glitternight brought Coker and Topaz to a gigantic Black Egg that rested at the bottom of Devil's Grotto and which contained within it a domain that was his soul. There, Glitternight transformed Topaz into a winged harpy-like creature under his control. (Werewolf By Night I#41 (fb) - BTS) - Elsewhere within the Black Egg, Doctor Glitternight placed Coker and LAPD detective Vic Northrup (who had come to Haiti in pursuit of Coker, whom he believed to be a werewolf) on a giant spiderweb made of glittering light, storing them for later use. (Werewolf By Night I#41) - After suffering a setback when Topaz was freed from his control and restored to normal, Glitternight retreated to the spiderweb and began draining their life forces to recharge his powers. When Brother Voodoo, Topaz and the Werewolf (now fully controlled by Jack's mind) caught up to Glitternight he was preoccupied with draining the last of the life from his nearly-dead victims and didn't notice them, enabling them to launch a surprise attack during which the Werewolf severed the "vampire-pipeline of light" which had been sucking the life from Coker and Northrup. 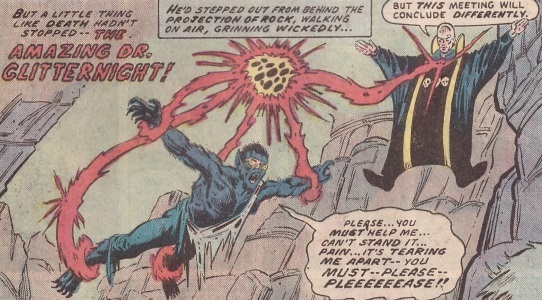 Seconds later, Glitternight released his former comrade, Fire-Eyes, whom he now controlled, and used him against the Werewolf while he battled Brother Voodoo. However, this proved to be a mistake because Voodoo soon freed Fire-Eyes from Glitternight's control, enabling him to attack the evil who had tormented him for so long, and Fire-Eyes and Gitternight seemingly destroyed each other. With Glitternight's death, his Black Egg was destroyed and everybody from the real world (both living and dead) who had been within it found themselves at the bottom of the now-empty Devil's Grotto. As the Werewolf changed back into Jack Russell in front of Northrup, thus proving to him that Coker wasn't the werewolf, Coker left the group and trudged over to a pile of zuvembie bodies which had been left behind. There, he found the body of Papa Jaranda and began weeping as he held it in his arms. (Werewolf By Night I#41 (ff) - BTS) - Coker saw to the reburial of his great-grandfather (and, presumably, the burials of his aunt and uncle as well). (Werewolf By Night I#42 (fb) - BTS) - A "few days" later, Coker, Northrup and Brother Voodoo said goodbye to Jack Russell and Topaz at the airport in Haiti. Comments: Created by Marv Wolfman, Gil Kane &plus; Tom Sutton. Thanks to Snood for providing me with scans of the prose story featuring the Werewolf which appeared in MONSTERS UNLEASHED! #6-7. This profile would have been incomplete without that story. Also, that story is the only source which identifies Coker as (according to Jack Russell) being "in his early twenties" and "a student at UCLA." How did Raymond Coker become a werewolf? The cause of Coker's lycanthropy has never been firmly established. However, his statement to Jack Russell (in WBN#19) about how he had "discovered the curse [he] bore" after coming to the United States would seem to strongly imply that he, like Russell, had also inherited it. After all, if he had become a werewolf via the other method, then surely he would have simply stated that he had survived a bite from a werewolf? And if he did inherit the curse, then which of his ancestors was the first to be cursed and under what circumstances? Was his father a werewolf before him? Or maybe his great-grandfather, Papa Jaranda? It seems like this would have been an interesting angle to pursue. How old was Raymond Coker? Raymond Coker's age is never revealed in the pages of his WBN appearances. His formality makes him seem somewhat older that the rest of the Colden House residents and the fact that he was so distraught when he found his great-grandfather's body suggests that he had actually known Jaranda, as a person, before his death. Given that Jaranda had died 32 years earlier, this implies that Raymond was in his mid to late thirties when he lived at Colden House. However, in the WBN prose story in Monsters Unleashed, Jack Russell (the narrator) described Coker as being "a tall lanky black man in his early twenties." Personally, I feel that the emotional connection Raymond had to Jaranda is more important than how old Jack Russell thought he was but I could be wrong. 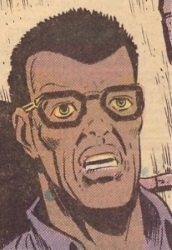 This character appears in (or is mentioned in) 19 different issues. He's seen but not named in WBN I#12, he's referred to by only his last name in five others and he's identified as "Raymond Coker" in twelve others. And then there's WBN I#21, in which he is mistakenly referred to, once, as "Paul Coker." I acknowledge that there are times when, due to a writer's mistake, it is necessary to clarify that a character's full name is actually a combination of two different first names that were given to him, with "Robert Bruce Banner" being the prime example of such a situation. However, in this case, I believe that renaming this character "Raymond Paul Coker" would be an overreaction. After all, the name "Paul Coker" is never spoken by anyone nor is it written anywhere. Instead, it only shows up in the narration for that one WBN issue. And given that Jack Russell, whose mind and memories are often twisted by his transformations, is the narrator in question, I have absolutely NO PROBLEM with the idea that Jack may have once (mentally) misremembered Raymond Coker's first name. Sometimes a mistake is just that, a mistake, and trying to explain it away is an unnecessary effort. Others may disagree. 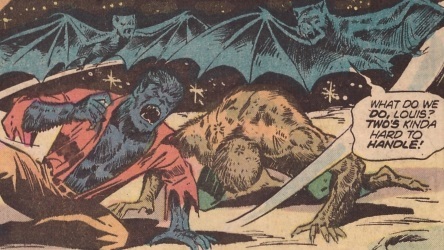 The Werewolf By Night character first appeared in three issues of Marvel Spotlight before his adventures continued in his own ongoing WBN series. However, during the 41-issue run of WBN, there were 10 stories published which featured the Werewolf but only two of them (ToD I#18, GSWBN#3) were actually incorporated into the ongoing series. As a result, those other eight stories (including the WBN prose story from Monsters Unleashed#6-7) have to be wedged into places where they weren't meant to go. So, what temporal clues does that prose story provide? First, Jack Russell is living at Colden House and knows Coker, Clary, Sam and Tina. Since WBN I#11 showed Jack moving in and meeting all four of those people and the events depicted in WBN I#11-12 take place over the course of two consecutive days, the Monsters Unleashed adventure MUST take place after WBN I#12. Second, Jack definitely doesn't know that Coker is also a werewolf. Since this is something that Jack only learned when Coker told him in a flashback in WBN I#19 and the events in that flashback occurred on Day Three of a full moon cycle which ran from within WBN I#17 through to the end of WBN I#19, the MU story MUST take place before panel 3 on page 9 of WBN I#17. The first two panels on that page cover the "weeks" that passed ("slow as cold molasses") between the day Jack and Topaz returned from Transylvania (via France) and the morning when Jack asked Coker about werewolves. This will be important later. Third, Jack's narration refers to "the couple of months [he's] known" Coker. Based on the first two of these clues, it is clear that the Monsters Unleashed story absolutely must take place after WBN I#12 and before WBN I#17 (page 9, panel 3). So, how many gaps are there between those two points into which the MU story could be wedged? I see only three. Gap #1 is between WBN I#12 & 13. A nice, clear space to put a full moon cycle but there are two problems. First, at that time Jack would only have known Coker for a single month and not for the couple of months mentioned in the prose story. Second, although Lissa claims that Phillip Russell has been "gone almost a month" (as of WBN I#14), that statement is actually a mistake by new writer Marv Wolfman since Phillip's kidnapping (in WBN I#10) actually took place two lunar cycles prior to WBN I#13-14. SO, if the prose story were to be set in this gap, then that would require that Phillip's time as a prisoner of the Committee be extended from two months to three. Gap #2 would be after the Taboo storyline ends and before the epilogue in which Jack and Topaz leave for Transylvania. To be more specific, in the "one week" that supposedly passes between panels 3 and 4 on the last page of WBN I#14. To begin with, the idea that the trip begins only one week after the last full moon is nonsense since there is a full moon in Transylvania on the first night that Jack spends there and the length of a lunar month does not change depending on where on Earth one is located. So, despite what the narrative says, at least 25 days must have passed between those two panels. (Also: AHA! JACK'S NARRATION CAN BE WRONG!). If need be, this gap could be expanded by another month but that would really undercut the idea that Jack wanted to get to Transvania as soon as possible after learning the truth about Phillip being his father's brother. Gap #3 would be covered by those two panels on page 9 of WBN I#17. The first eight pages cover the end of the Werewolf's Fourth Night in Paris, France which is the conclusion of the storyline which began on the last two panels of WBN I#14 and continued through Tomb of Dracula I#18 and WBN I#15-16. Those two panels cover the "weeks" between the last full moon of the previous month and the first full moon of the next, with the story from panel 3 onwards covering the Day One, First Night, and part of Day Two of Jack's next "Werewolf curse" cycle. And it's on Day Three of that cycle that Jack learns that Coker is a werewolf. Sure, there are two separate temporal references to the fact that this story is supposed to take place only a month since Jack's trip to Transilvania but neither of them actually affects the story and so can be ignored if necessary. So, in conclusion, it looks like Gap #3 is the best (albeit imperfect) place into which the events of the Monsters Unleashed prose story (and the extra month needed to accomodate that story) should be inserted, with Gap #2 being a fair second choice. I leave it up to others to decide which is better (least disruptive) with regards to Jack Russell's personal chronology. [Tomb of Dracule I#18/Werewolf By Night I#15-16-17 (pages 1-5)] - JR in Europe during the Four Nights of the full moon. There are two things that I would like to point out about this chronology. First, although I haven't marked it down, Raymond Coker must be presumed to have used his anti-transformation spell from before he first met Jack (in issue #11) until the spell was destroyed (within issue #18). Second, if closely examined, this timeline demonstrates one of the problems that writers have in chronicling the adventures of a character who is only active three days out of every lunar month. Specifically, since the main character's life has to jump forward 26 days between each adventure, having sub-plots develop alongside the main storyline can be difficult. Consider the following: From Jack Russell's perspective, the events in issue #38-41 take place two lunar months after issue #29. 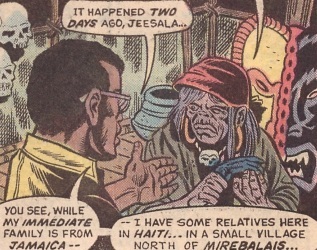 However, from Raymond Coker's perspective, his sub-plot in issues #29 and 31-33 covers a single conversation with Jeesala, one which, as revealed in issue #33, takes place two days after he arrived in Haiti (probably soon after Northrup visited Colden House). This means that the elapsed time of Coker's sub-plot in issues #29-33 is no more than a few days. So, what was he doing during the other 55 days that elapsed for Jack in Los Angeles during issues #29-38? Surely Jeesala didn't keep him dreaming (and screaming) for all that time? Papa Jaranda is said to have died in 1943, but this is a topical reference in 1943 A.D., meaning 32 years prior to the then-present year of 1975.
anyone else with the first name "Raymond" or the last name "Coker." Raymond Coker's aunt and uncle lived with their daughter Banita in a small village north of Mirebalais in the country of Haiti on the island of Hispaniola. Their family name has never been revealed nor have the given names of Banita's parents. During a night of a full moon, Banita's family was gathered around a table to take their evening meal when their door was suddently shattered by a punch and a man entered. 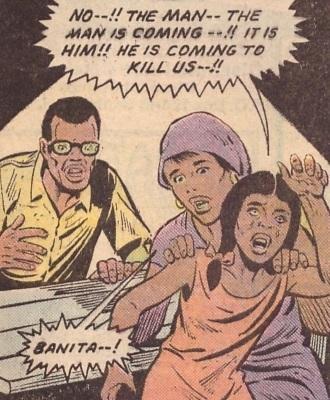 The intruder quickly grabbed both of the adults by their necks and strangled them in front of Banita. Then, once they were dead, the man left, dragging their bodies with him as Banita could only watch and scream. Afterwards, Banita was cared for by a family friend named Maura. Banita told Maura everything that she had seen, including the fact that the man who had killed her parents was "Jaranda." Once she'd told her story, Banita lapsed into shock and stopped speaking. She was examined by doctors in Port-au-Prince, Haiti's capital city, but they could do nothing except put her in the hospital. Since there was no money for that, Maura brought Banita back to her home village and cared for her there. NO--!! THE MAN -- THE MAN IS COMING--!! IT IS HIM!! HE IS COMING TO KILL US--!! IT IS HIM -- IT IS JARANDA--!! PAPA JARANDA!! PAPA JARANDA!! Since "Papa Jaranda" was Raymond's (and Banita's?) great-grandfather who had died 32 years earlier, Raymond realized that the murders were the work of a zuvembie and he sought out Jeesala of the Thousand Years for help in dealing with the threat. What happened to Banita after that outburst has never been revealed. If the fact that she had spoken meant that her state of shock had ended, then she may have remained in the care of Maura (or Raymond, if he stayed in Haiti). However, if she had returned to her state of silent shock, then Raymond may have paid for her to be hospitalized. Also unrevealed is what happened to the bodies of Banita's parents after the Jaranda zuvembie dragged them from their house. In the month between the murders and Raymond's arrival neither body had been found. Since Jaranda had been raised by the sorcerer Doctor Glitternight to be part of the army of zuvembies he wanted, it may be that they were also raised as zuvembies by Glitternight. It's also possible that, after finding Jaranda's body in the pile of zuvembies left inanimate by Glitternight's death (in WBN#41), Coker later found Banita's parents' bodies but no mention of such a discovery has ever been made. Jaranda was Raymond Coker's great-grandfather who lived in the country of Haiti on the island of Hispaniola until his death 32 years before. Known as "Papa Jaranda" to most of his family, he may have lived near the small village north of Mirebalais where his grandchild and his/her spouse later lived. One night, under a full moon 32 years after he had died and been buried, Jaranda was raised from his grave as a zuvembie by the evil sorcerer Doctor Glitternight. For some reason, on a night when there was a full moon, the Jaranda zuvembie went to the house where Banita's family lived and shattered the door with a single punch. After entering the house, the zuvembie then strangled the two adults present while their daughter, Banita, unable to help, could only watch. Then, once his victims were dead, the zuvembie left, dragging the bodies of Banita's parents into the night, leaving the young girl behind, screaming. The activities of the Jaranda zuvembie over the following month have not been revealed. It's possible that Jaranda was among the half-dozen or so zuvembies who attacked Brother Voodoo, Jack Russell and Topaz as they approached Devil's Grotto but this has not been confirmed. Later, within Glitternight's enormous Black Egg at the bottom of Devil's Grotto, the Werewolf (with Jack Russell's mind) and Daniel Drumm's spirit (made visible and solid within that place of death) came across the incubator chamber where the real zuvembies were being used as models for the duplicate fake zuvembies (made of Glitternight's light). Jaranda may have been one of these templates. Later, after Glitternight had sent the transformed Topaz to attack the Werewolf and Daniel, he also commanded the real zuvembies to rise and attack as well. It was only with help from Brother Voodoo, who trapped the zuvembies and Glitternight's light-demons in a circle of fire that caused them to attack each other, that the heroes were able to escape from the battle and follow Glitternight. Finally, after Glitternight and Fire-Eyes had killed each other, the Black Egg (a manifestation of the sorcerer's vile soul) collapsed and disappeared, leaving everything real that had been within it, both the living and the dead, lying on the bottom of Devil's Grotto, now restored to normal. As the Werewolf willed himself back to his human form, Raymond Coker spotted a pile of now-inert zuvembie bodies and staggered over to them. Once there, Coker singled out Papa Jaranda's body and held it in his arms as he wept over it. It is presumed that Coker later had Jaranda's body buried again. Note: One thing that was not clearly established was why Jaranda's zuvembie murdered Banita's parents and took their bodies. Sure, it was probably because Glitternight wanted more bodies that he could then raise as zuvembies for his planned army but, if that were the case, then where were Banita's parents? Did Glitternight become impatient with how much time it took to raise real zuvembies and decide to use them to create his fake zuvembies, formed of rock and animated by his light? Or did writer Doug Moench just forget to reveal what happened to their corpses? Maura was a young woman who lived in a small village north of Mirebalais in the country of Haiti on the island of Hispaniola where she was a close friend of Raymond Coker's aunt and uncle. After both of Banita's parents were brutally murdered in front of the young girl's eyes, Maura took care of Banita. Before she lapsed into shock and stopped speaking completely, Banita told Maura all that she had witnessed, including the fact that the murderer was "Jaranda." However, Maura did not believe this could be true because she knew that Jaranda was Banita's great-grandfather who had been dead for 32 years. With Banita in her care, Maura took the young girl to the capital city (Port-au-Prince) to see if any doctors there could treat the traumatized and now completely silent Banita. Unfortunately, the doctors said that they could do nothing except put her into hospital and, with no one to pay for that, Maura brought Banita home with her. It may have been Maura who sent news of the deaths of Banita's parents to Raymond Coker in Los Angeles. When Raymond Coker came to Haiti to investigate these deaths, he sought his little cousin Baita and found her in Maura's care. At his request, Maura told him all that Banita had told her before she stopped speaking. When Maura repeated Banita's claim that the murderer was Jaranda, the little girl broke her silence and began screaming that "The Man" was coming to kill them. Maura held the hysterical girl and tried to calm her by telling her that there was no one coming but Banita continued to cry out the name "Papa Jaranda!" What happened to Maura (and Banita) after that outburst has never been revealed. If the fact that Banita had spoken again meant that her state of shock had ended, then she may have remained in Maura's care. Otherwise, if Banita returned to her silent state of shock, then Banita was probably sent to the hospital, with Raymond paying for her treatment.